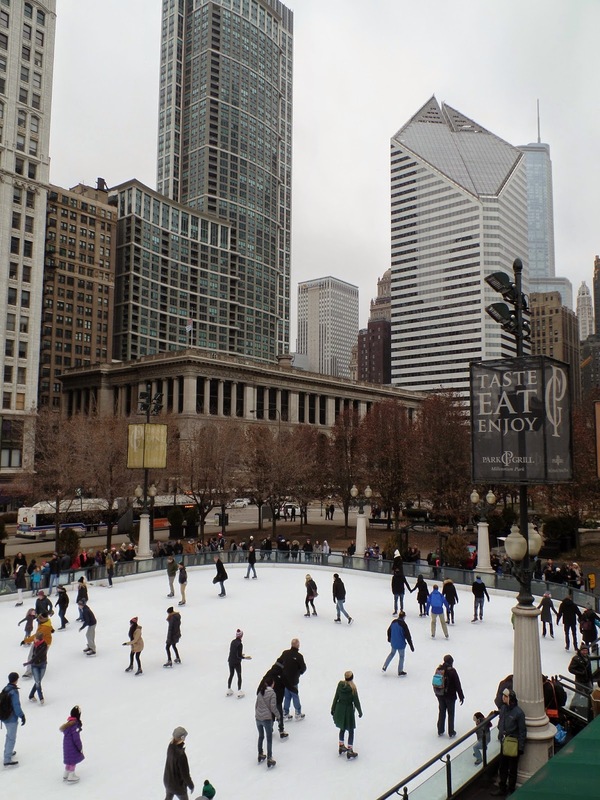 I really didn’t think I was going to need three posts to cover the weekend my niece and I spent in Chicago, but there are still a few things to share with you! We barely scratched the surface of the multitude of things here are to see and do in this great city. No matter what your interests are (sports, the arts, music, architecture, comedy, fine dining, etc.) or who you’re traveling with (yourself, friends, your spouse, or the whole family), Chicago offers something for everyone. 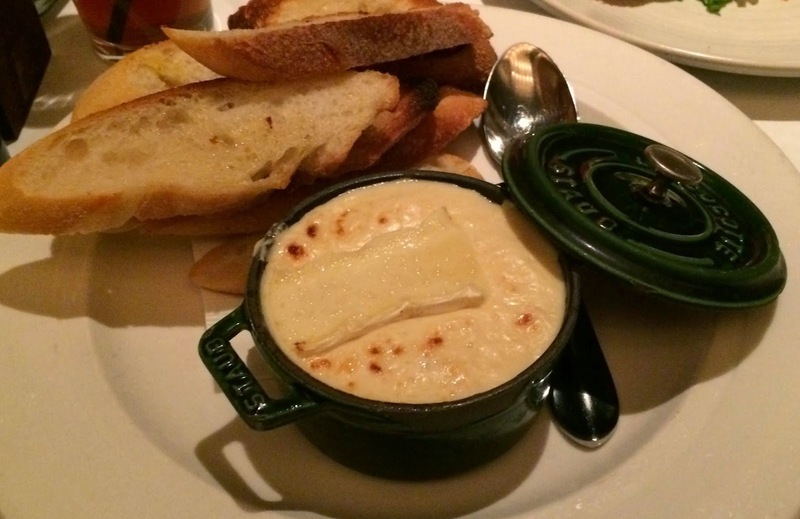 In this post, I’ll cover our dinner at The Gage, our breakfast at Eggy’s, our visit to Millennium Park and the Art Institute, and a review of the Fairmont Hotel. Before I get started, however, I need to make a clarification to my previous posts. I always strive to accurately portray all of the the things I write about, and I welcome and appreciate feedback from my readers if, perhaps, I fall short of that goal. After my last post, I was personally contacted by a reader named Katie who had an issue with my writing. This very picky reader happens to have the same last name as me and is the daughter of my brother. Yes, that’s correct, she is the niece I’ve been writing about. Anyway, this dear reader of mine was very excited to be featured in my posts, but thought that I left something to be desired in my description of her. Since she and her sister were the ones who really encouraged me to start this entire blogging adventure that I have since fallen in love with, I figure I owe her one. First off, I apparently gave the impression that she is a little girl (maybe because she always will be to me), but she’s actually 18 and a freshman in college, pursuing a law degree. Some additional adjectives she wished to have included in her description are: gorgeous, brilliant, funny and awesome. Since I promised to always be truthful in my posts, I’m lucky that these are all completely accurate. And now, back to our regularly scheduled post! 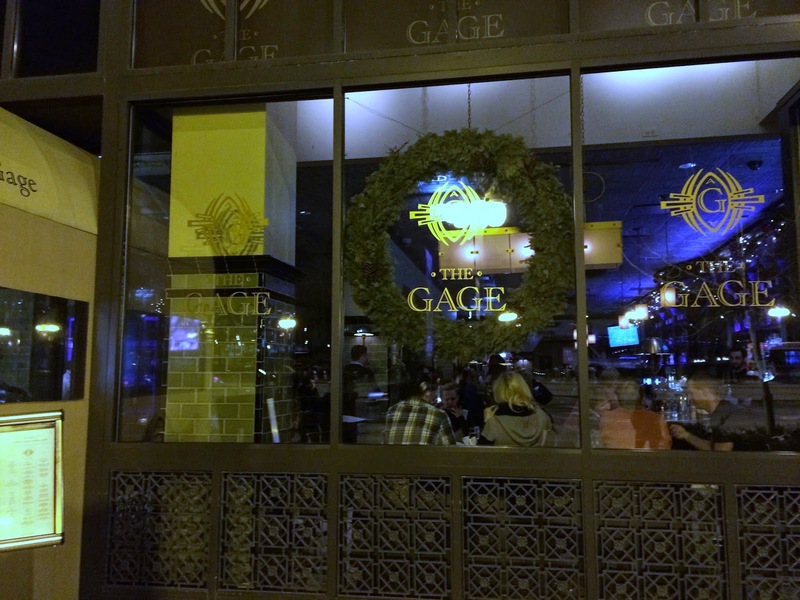 We wanted to have dinner at The Gage on Michigan Avenue, right across from Millennium Park. However, when I called to make reservations, I was told they were fully booked for the night. This misfortune led to the first thing that really made me happy with the Fairmont. We stopped by the concierge on our way out to the Christkindle Market and asked if there was anything he could do for us. He called up The Gage, and two minutes later, we had reservations for 7:30 and some recommendations on what to order. Perfect! The Gage opened in 2007 and inhabits a building that was constructed in the late 1800s. When you walk in, you enter a bar/tavern type area filled with smaller tables and high-tops. Walk through this area and you will find yourself in the restaurant proper with lots of tables packed in to several different rooms. Even though the tables are close together, they somehow make sure you still feel like you are in your own space. The peak of The Gage’s popularity seems to have been in 2011 and 2012, when it was written up in countless newspapers and magazines and websites, but judging by how crowded it was, it’s certainly still doing very well. 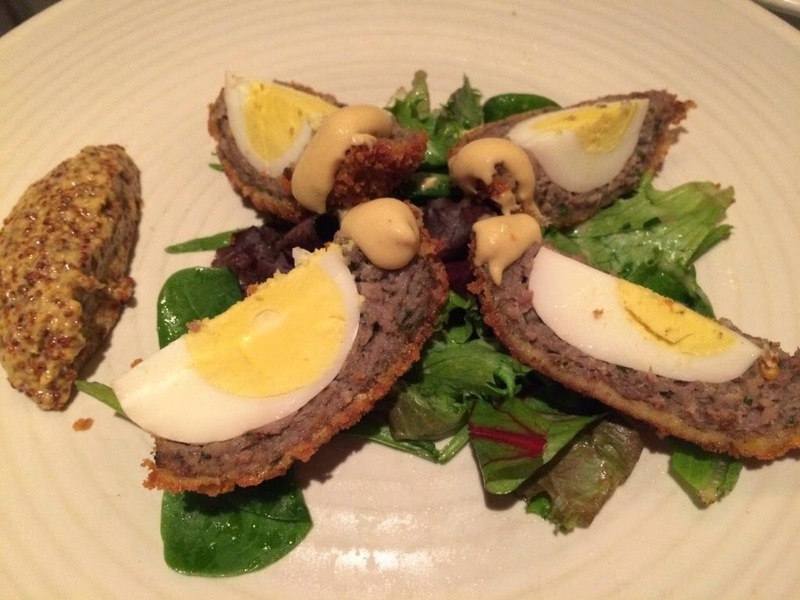 For starters, I ordered a Scotch egg ($8) and Katie ordered the “Gage N-17 Fondue” ($11) made with brie and butterkase (translates from German as “butter cheese”…yum). The Scotch egg was really good, but the fondue was truly spectacular. Moving on to our main courses, I ordered the Half Pekin Duck Smoked Breast & Confit Leg ($34) and Katie ordered the Roasted Amish Chicken Breast ($24). 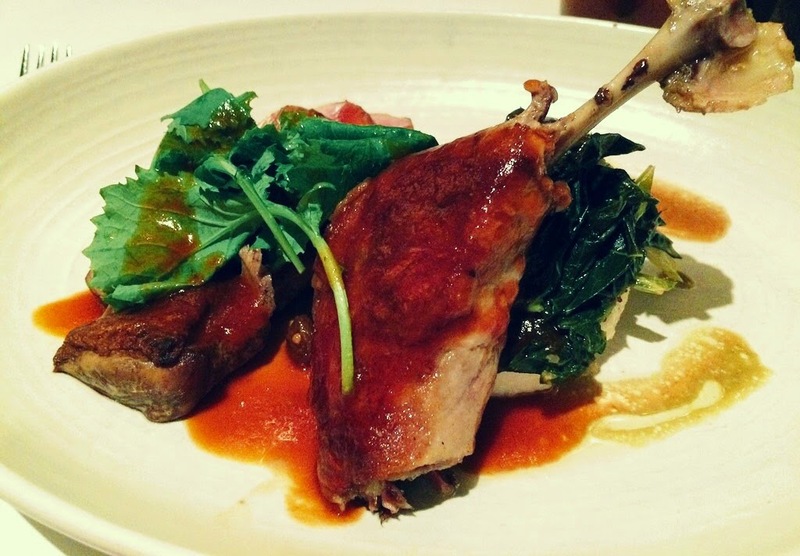 Although the confit leg was very good, I discovered I’m not much of a duck breast fan. I’m sure it was good, but I just personally didn’t enjoy the rare-ness of it (furthermore, after I ate, I made the mistake of Googling “Pekin Duck” and found it to be an adorable white fowl, making me really wish I hadn’t ordered it). I did, however, enjoy the greens, grits and pickled fruits that accompanied it and were never adorable. 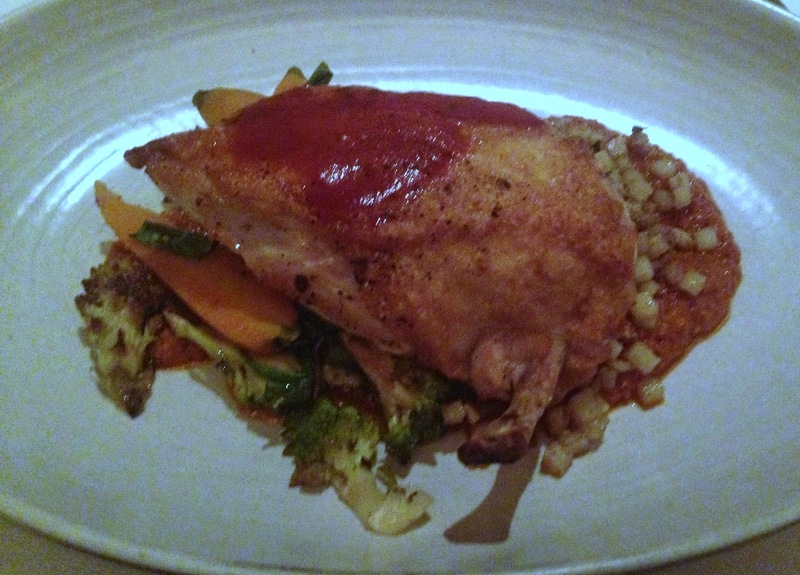 Katie’s chicken breast was perfectly cooked and served with a delicious hazelnut Romesco and Yukon potato-smoked chicken hash. They had some delicious-sounding desserts, but after all that we had eaten throughout the day, we simply couldn’t eat any more. Service was really good and the whole experience was enjoyable. I would definitely recommend this restaurant. After a good night’s sleep, we got up the next morning and headed to Eggy’s Diner for breakfast. It was a bit tricky to find, but well-worth it. The atmosphere was fun and relaxed, and perfect for a Sunday morning. We had to wait about ten minutes for a table, but it went by quickly. There were a ton of delicious-sounding things on the menu, but we settled on banana-Nutella French toast for Katie and banana pecan pancakes for me. The portions were huge, the food was excellent and the prices were very reasonable. At this point, we basically had to roll ourselves out of the restaurant. Knowing we had a lot of calories to burn off, we headed off to Millennium Park and walked around. We saw Cloud Gate (honestly, I had to look up the real name of this sculpture just now, because I only know it as “the bean”), the skating rink and some of the other sculptures/works of art throughout the park. Unfortunately, it was still very gray and cloudy, because the bean looks incredibly awesome on sunny days with blue skies. Our last stop was the Art Institute, which boasts the second largest collection of Impressionist paintings outside the Louvre in Paris. Voted on Trip Advisor as the Traveller’s Choice #1 museum in the world for 2014, there are always many worthwhile temporary exhibits to see in addition to its permanent collections. If you enjoy art, this is a place you absolutely must visit while in Chicago. 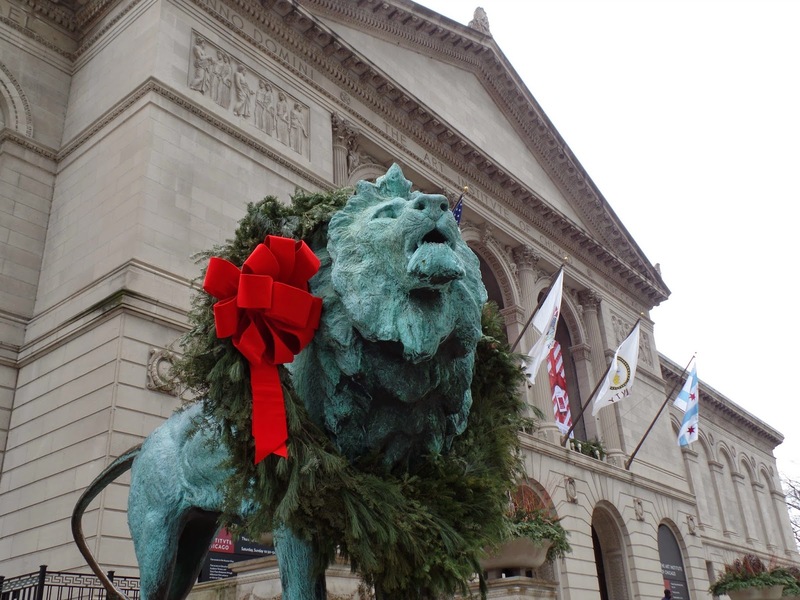 If you aren’t an art fan, at least walk by the building (right next to Millennium Park) to see the famous lions outside. At this point, it was time to head back to the hotel and check out. Though our stay at the Fairmont was a brief one, it was enjoyable. The location simply can’t be beat. It’s a block away from the new Maggie Daley Park and Millennium Park, and some of its rooms have a view of both of these. The river is just a couple of blocks away in the other direction, and it’s also very near the theater district and State Street for shopping. Our room was on the 36th floor (there are 37 floors total) and looked out toward the river (though we couldn’t see it) and the new Trump Tower. Check-in was quick and seamless, and, depending on who you talk to, the front desk staff can be helpful (we asked for the quickest way to get to the Christkindle Market, and one of the staff members said she had no idea. Luckily, the other one was able to tell us.) As mentioned earlier, the concierge was very helpful in getting us reservations at the restaurant we wanted. The bathroom had a separate tub, shower area and toilet area. There was a blow dryer, lighted make-up mirror and nice bath products, as well. The only thing I will complain about is the fact that they charge $65 per night for parking, which is really quite outrageous. There are several nearby parking garages for cheaper ($25 – $35 overnight), but it all comes down to convenience. If you want to be able to make a phone call and have your car brought to the front door, be prepared to pay for it. If you don’t mind the inconvenience of walking a block or two with your luggage and getting your own car, then do some research and find a nearby garage. 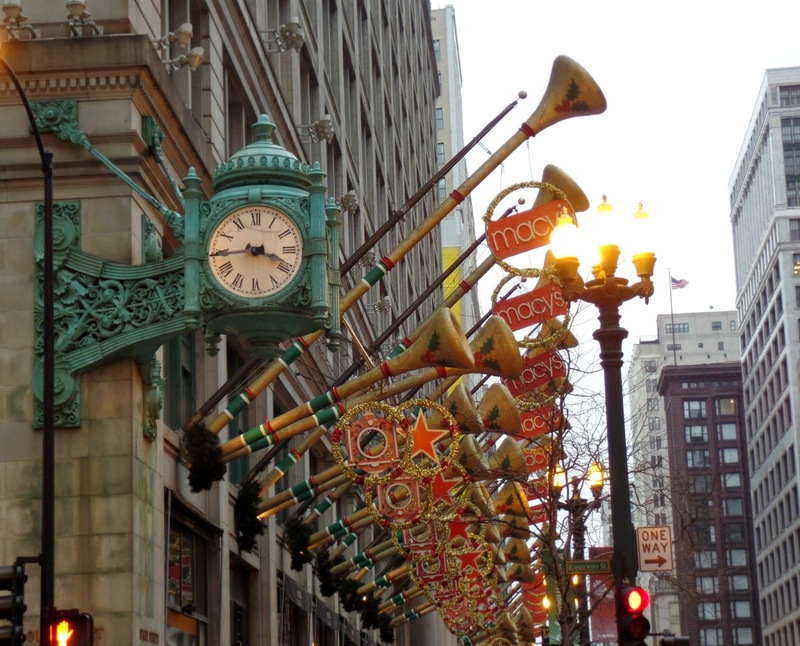 If you have never been to Chicago, I hope these posts have shown you that it really is a worthy travel destination for everyone. After the time we spent there, I have resolved to make it into the city more often in 2015. So stay tuned for more in the future! I also just ate at Eggy's last weekend! I had the Irish skillet and it was INCREDIBLE. Even though I am not usually a potato person, these potatoes were cooked really nicely and seasoned to perfection. The staff was super friendly too. I definitely agree it is worth the try for anyone! It's great there, isn't it??? I can't wait to go back. I also want to try Yolk some time…I've heard really good things about it.